Carlos Rubio graduated in International Relations at the Faculty of Social and Political Science from the National Autonomous University of Mexico. He also has a Masters degree in U.S.-Mexico Studies at the same University. He is a research assistant in the Economics Research Institute at the National University, and assists in the research named: 'The effects of the global crisis on the flow of capital and labor in the Mexico - United States relation and its impact on labor markets. Theoretical considerations.' He is also a professor of geopolitics, international politics, Mexican foreign policy and international relations theories at the Insurgentes University in Mexico City. 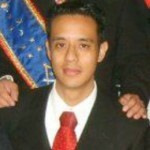 Carlos is a member of the Mexican International Studies Association. Chairman of the Latin-American Academy of Science, Arts and Humanities in Mexico. Association responsible for the dissemination of the scientific and academic knowledge in Mexico. Carlos is currently assisting Jaime Maussan in raising exopolitical issues in the Mexican media through 'Tercer Milenio' TV that is broadcast via the Televisa Network to all Latin American countries, Europe, the United States and also through the Sky Satellite System. Carlos Rubio is a member of the Advisory Board of the Exopolitics Institute.